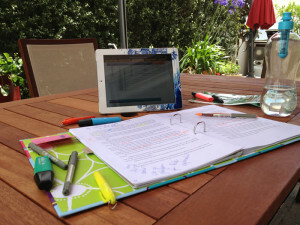 I love my outdoor workspace (except when it’s 30 degrees outside). For the past month, between work, karate and finally reading Divergent (excellent book, by the way), I’ve been working on the second draft of Hero . And although I haven’t made as much progress as I would have liked, and I’m busting to get to the second part of the my revision process (editing the prose – why does ‘prose’ always sound so snobbish? ), the novel is coming along nicely. The plot has been reworked, using the 7-point plot system, with eight scenes getting the axe and fifteen new ones added. And, I’m half-way through plugging the plot holes (which is where the ‘whoo!’ comes in). I’m not entirely sure what function the meta descriptions are going to play (other than sorting out my timeline), but I’m sure inspiration will strike at some point. I have a detailed chapter-by-chapter and scene-by-scene synopsis in hard copy and a clear plan of action. Plus, I can quantify the work that needs to be done, which makes the actual work easier because I have something to work towards and tick off. All of which makes for a total of 39 scenes, and to date I’ve completed 21. I’m almost half-way there! Double whoo! Sign up to the newsletter to get the first two chapters of Hero in your inbox for FREE!